Today’s Friendly Food is brought to you by my good friends Sara & Jesse Arthur. I had the privilege of living next door to them for several months, those poor souls had no choice when it came to this project of mine, they were hosting whether they liked it or not, luckily they pretended they liked it. 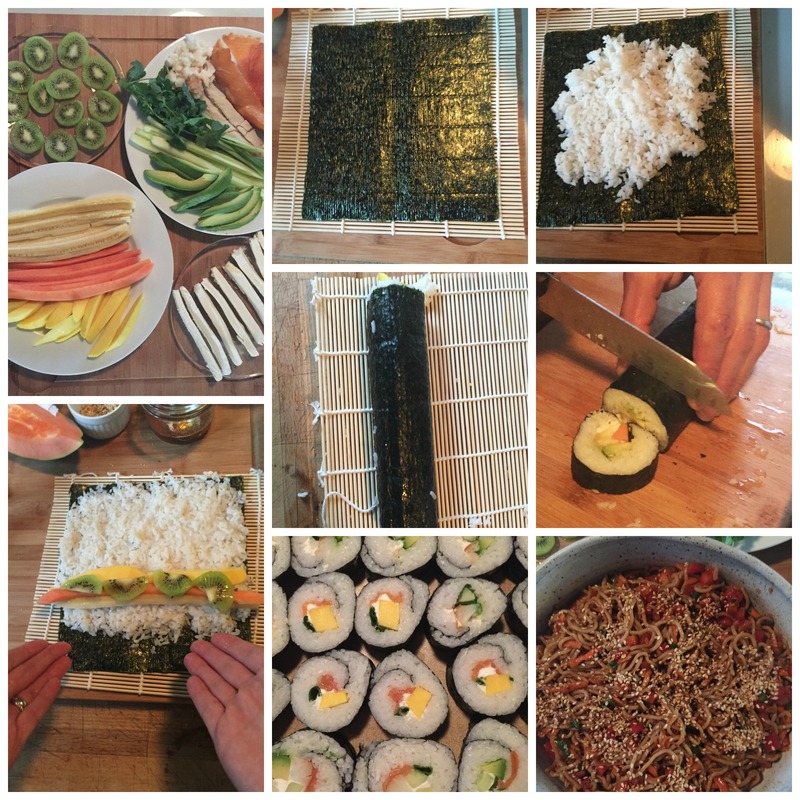 I had never considered rolling my own sushi, I mean I didn’t think I could ever better my “Mr. Perfect” roll at Seattle’s Umi Sake House, my mouth is salivating as I speak. When I arrived I was immediately put to work stirring the rice, and cleaning and cutting the various ingredients, all a safe choice, very hard for me to mess that up! It turns out that it is very hard to mess up any part of this meal, everything was shockingly easy! When all the items were prepped and laid out in front of us, like a painter with various colors and tools, we started creating our edible art! It was so easy and fun to grab the various items, throw it on the rice and then roll! It reminded me a bit of rolling a sleeping bag, being careful that nothing poked out the ends, making sure it was tight. It was so much fun to do various combos, getting better at my rolling technique and whipping out roll after roll! The only thing that brought me greater joy than rolling the sushi was eating the sushi! Sara had pre-made an amazing Yokisoba salad as it had to sit for several hours before serving, the recipe is below. I can’t wait until I have an opportunity to wow people with my new sushi skills! A huge thank you to my hosts Sara & Jesse! Toss the ingredients together and chill for 2-3 hours.